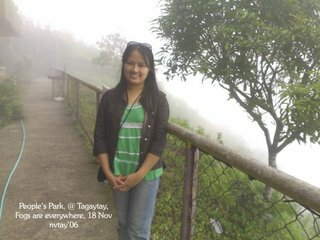 My brother in law, sister and I planned to go to Tagaytay. 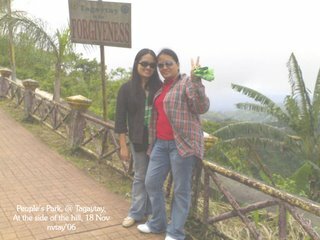 I've been in Manila for many times, but I've never have the chance to go to Tagaytay, since mostly people likes to be there. 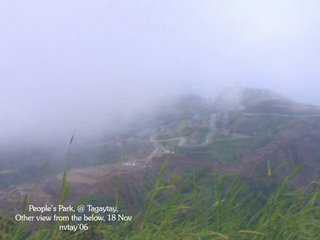 Aside from the cold atmosphere, there are lots of nice tourist spot were you can spend time and look at the wonderful world. So its because its not like GenSan, we have to wake up very early in the morning to get ready. Its like 1 hour travel if you have your own vehicle. We rode only the trycicle to get there, its kinda adventure, although its pretty much tiring and dangerous. We have this high speed inorder to get there early and so us to see the whole place without thinking that sooner it would be dark there. I've finally seen the place and its really relieving if you have problems and if you need a place to relax. 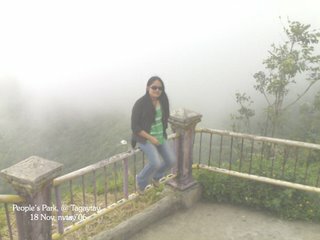 We climb to the highest mountain where you can see the lower part and would be even seen the whole Manila, but not luckily for me to see it because fogs were all over the place. 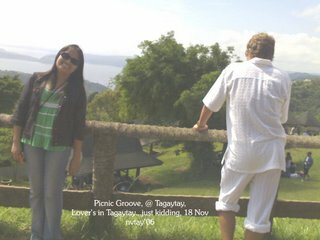 We also went to Picnic's Groove where mostly movies were been shot in that place. Its a nice place for family to spend time and at least relax too.